Loren The Amazon Princess is a new role playing/visual novel hybrid game for Linux. The game has been made using popular Ren'py game engine. 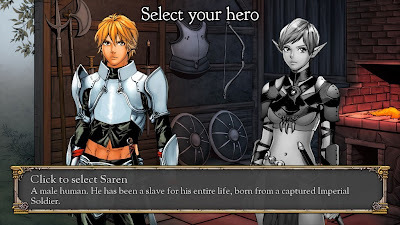 You play as Saren or Elenor to join the Amazon Princess Loren in her journey to find what happened to her mother. On your way you fight monsters, discover new places, find romance and defeat the evil Fost. The game features different endings, 6+ romances, old school turn based RPG battles, beautiful manga art and some NSFW content. A "cover up" option is available to make the game more appropriate for a younger audience. The game can be purchased on Desura for $25 ( a free Linux demo is also available).